More than four years ago I wrote about the Rhum Vieux Millésimé 1998 10 YO made by Dzama and concluded that I was pretty stoked to see what else the brand had in the larder. It’s taken a long time for me to make good on that desire, so here we have something lower down on the totem pole from the same company, and I thought it was a good effort, for all its youth and in spite of the niggly questions it raised. Let’s refresh the memory first: for the geographically challenged, Madagascar is that huge island off the south east coast of Africa; and the Dzama rums are made by Vidzar, formed in 1980 due to the efforts of Mr. Lucien Fohine, who noted that the small sugar factory on the tiny island of Nosy Be produced a distillate that had distinctive flavours which persisted into the final distilled products…mostly low level rum for local consumption, to that point. He concluded it came from the ylang-ylang plant (also known as the macassar oil plant, or the perfume tree) whose roots intermingled with that of the cane. He formed a company Vidzar (a contraction of Vieux Rhum de Dzamandzar), which initially concerned itself with whisky bottling. It was located close to the sugar cane fields of Nosy Be, near to a village called Dzamadzar, but a few years later, as their operations expanded, they transferred production to Antananarivo (the capital, in the center of the island) The company, which now claims a majority of rum market share in Madagascar, makes a range of rums, including the Dzama Club, 3 YO and 6 YO, the Millésimé 1998 10 Year Old, Dzama 15 and 25 year old rums and a Cuvée Noire. Most of these are untried by the vast majority of rum drinkers, and remain relatively unknown, though many have won prizes between 2010 and 2015, in Miami, Paris, Berlin and Madrid. All that said, there isn’t much on the company website about the technical details regarding the 3 year old we’re looking at today. It’s a column still rum, unadded-to, aged in oak barrels, and my sample clocked in at 52%, which I think is an amazing strength for a rum so young – most producers tend to stick with the tried-and-true 40-43% (for tax and export purposes) when starting out, but not these guys. Now, the theory is that the oils and perfumes of the various botanicals to be found on Madagascar (vanilla, cloves, pepper are often cited) leach from their roots into the soil and are intermixed with the cane plants’ own root systems, into their stems, and thence to the ultimate distillate. I’m no chemist or botanist, but one could just as easily wonder why similar processes aren’t observed on the spice island (Grenada) for example, so I reserve judgement on that score. Be that as it may, the nose is quietly rich for a rum aged a mere three years – not Velier-Demerara-go-for-the-brass-ring rich, just more than one would expect going in. This nose was initially redolent of creamy feta cheese, brine, red olives and cashew notes, and had a nice line of rotting bananas and funk coiling about in the background which provided an underpinning of real character. It also gave off subtler aromas of candied oranges, pears and other light fruits, just not enough to take over and make it a fruit bomb. But towards the end there was a more dominant element of toffee, coffee grounds and vanilla which I thought pleasant but overdone, especially since it was delivered with some real force. Though it teetered right on the edge of being too hot, it presented a solid if sharp drink, an amalgam of salt and sweet…and a lot of brown sugar and vanilla There were bananas, strawberries, cherries, and some of that tart and creamy sensation you get from an unsweetened fruit smoothie made from, oh, firm yellow mangoes and pineapple. The vanilla remained, the coffee disappeared, and amusingly, I could actually taste sweet green peas. Much of the saltiness and nuttiness of the nose was gone, though still noticeable, and it did not unbalance the fruity aspects. The finish was where it failed, I thought – it was medium long, somewhat spicy, just rather mild, with closing notes of fruits, vanilla, salted caramel, coconut shavings, and a little citrus. Well, what to make of this? The nose was decent, the palate was nearly as good, a reasonable drink even by itself….particularly if you like the hints of spices. Does that mean natural or other spices have been added? They say no, and hydrometer tests show no obscuration… but I can’t help but wonder. Rums this young tend to be rather sharp and retain competing notes that saw across the palate, better off in mixed drinks than to have neat; the Dzama 3 YO was sippable and had the edge toned down, and for that to happen at that strength raises the eyebrow. However, in the absence of more information, I’ll leave it there for now as a note for those who want to know. That first Dzama I tried, the 1998 10 YO, had what at first sight seemed like an utterly standard profile that then expanded into something quite unconventional and interesting. The 3 year old is not on that level. The vanilla is a shade too dominant, and while fortunately having enough other taste elements in there to move beyond that, it remains ultimately straightforward. But it is, nevertheless, a good drink for what it says it is, and demonstrates that a rum doesn’t have to be the latest Velier, Worthy Park or Foursquare juice, or from some independent’s minuscule outturn, to be a rum worth checking out. Wes was much more disapproving of the spiced profile in his review. It’s his hydrometer test I referenced. 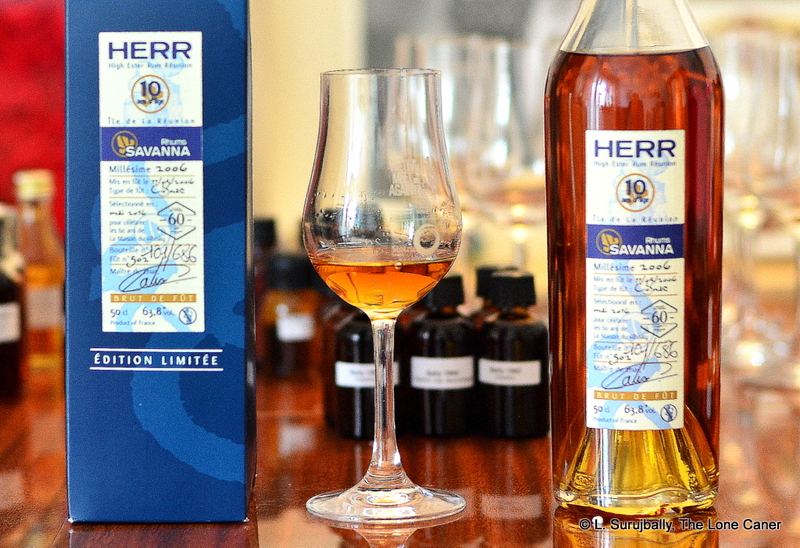 The Savanna Millésime 2006 High Ester Rum from Réunion (or HERR, as it is labelled) is a steroid-infused Guadeloupe rum mixing it up with a Caroni and a Bajan. It may the closest one will ever come to one of Worthy Park or Hampden’s Jamaican taste bombs without buying one, betters them in sheer olfactory badassery and is possibly one of the best of its kind currently in production, or the craziest. It’s very likely that once you try it you’ll wonder where it was hiding all this time. 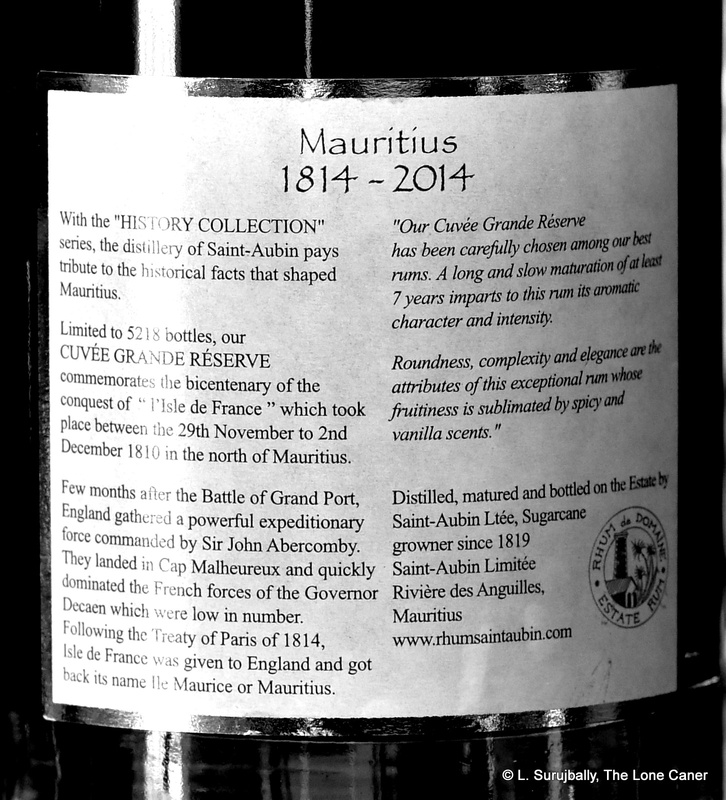 It emphatically puts Réunion on the map of must-have rum producing nations with not just flair, but with the resounding thump of a falling seacan. Just to set the background. 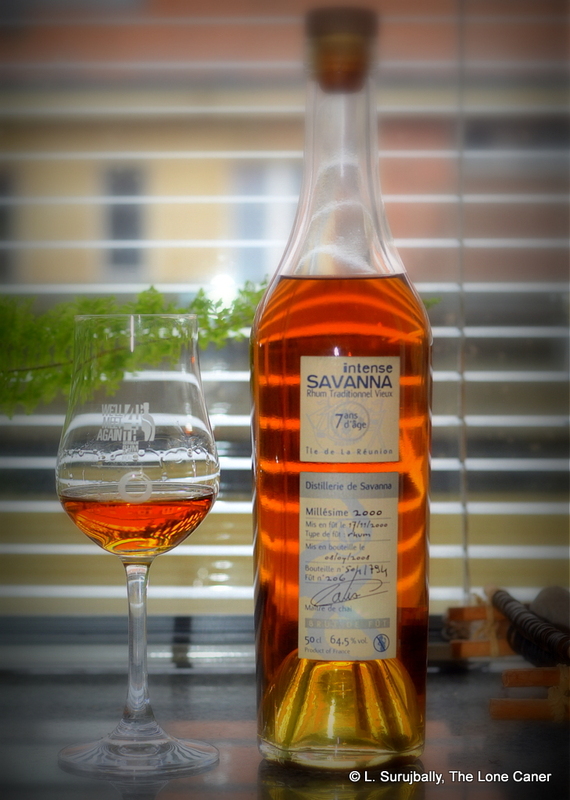 I had bought the Savanna Rhum Traditonnel Vieux 2000 “Intense” 7 year old back in April 2016 in Paris, and when I finally wrote about it, remarked on the way it was interesting and tasty and seemed to channel a good Guadeloupe rum in that it walked a fine line between molasses based product and an agricole. Purely on the strength of that positive experience, I sprung for the HERR, and made some notes to get some of the other “Intense” and “Grand Arôme” Lontan series from Savanna as well (see “other notes”, below). The molasses-based HERR was distilled in 2006, aged for ten years in ex-cognac casks, bottled at a hefty 63.8% in 2016, bottle #101 of 686, and released for the 60th Anniversary of the Parisian liquor emporium La Maison du Whisky. Anyway, after that initial enjoyable dustup with the “Intense”, I was quite enthusiastic, and wasn’t disappointed. Immediately upon pouring the golden-amber liquid into my glass, the aromas billowed out, and what aromas they were, proceeding with heedless, almost hectic pungency – caramel, leather, some tar, smoke and molasses to start off with, followed with sharper notes of vanilla, dark dried fruit, raisins and prunes and dates. It had an abundance, a reckless, riotous profusion of flavours, so much so that one could be forgiven for thinking that not only did Savanna throw in the kitchen sink in making it, but for good measure they included the rest of the kitchen, half the pantry and some of the plumbing as well. Even the back end of the nose, with some overripe bananas and vegetables starting to go off, and a very surprising vein of sweet bubble-gum, did nothing to seriously detract from the experience; and if I were to say anything negative about it, it was that perhaps at 63.8% the rum may just have been a shade over-spicy. Still, whatever reservations I may have had did not extend much further than that, and when I tasted it, I was nearly bowled over. My God but this thing was rich…fruity and tasty to a fault. Almost 64% of proof, and yet it was warm, not hot, easy and solid on the tongue, and once again — like its cousin — weaving between agricole and molasses rums in fine style. There was molasses, a trace of anise, a little coffee, vanilla and some leather to open the party; and this was followed by green apples, grapes, hard yellow mangoes, olives, more raisins, prunes, peaches and yes, that strawberry bubble-gum as well. I mean, it was almost like a one-stop shop of all the hits that make rum my favourite drink; and it lasted for a long long time, closing with a suitably epic, somewhat dry finish of commendable duration which perhaps added little that was new, but which summed up all the preceding notes of nose and palate with warmth and heat and good memories. There was simply so much going on here that several subsequent tastings were almost mandated, and I regret none of them (and neither did Grandma Caner, who was persuaded to try some). It presented as enormously crisp and distinct and it’s unlikely to be confused with any other rum I’ve ever tasted. Just as an (irrelevant) aside, I was so struck with the kaleidoscopic flavours bursting out of the thing that I let the sample remain in my glass for a full four days (which is likely four days more than anyone else ever will) and observed it ascending to the heights before plunging into a chaotic maelstrom I’m somewhat at odds to explain. But one thing is clear – if the sharp fruitiness of unrestrained rutting esters is your thing, then you may just agree with me that the rum is worth a try, not just once, but several times and may only be bettered by the Lontan 2004 12 year old 64.2% made by the same company. I said in the opening remarks that it might be the best of its kind currently in production, or one of the craziest. I believe that anyone who tries it will marvel at the explosive panoply of flavours while perhaps recognizing those off-putting notes which jar somewhat with what one expects a rum to possess. Having read of my experience, I leave it to you to decide which side of the divide you fall on. The HERR is not so much polarizing as unique, and it demands that you accept it as it is, warts and everything, on its own terms or not at all. If you do, I somehow doubt you’ll be disappointed, and may just spend a few days playing around with it, wondering what that last smidgen of flavour actually was. Sort of like I did. Personal encomiums and opinions apart, I should inject a note of caution. When tried in conjunction to the muskier, deeper Demeraras, HERR’s relative thinness becomes more apparent. Too, after some hours, that vein of bubble-gum sweet also takes on a dominance that can be off-putting to those preferring darker tastes in their rums, though such a whinge would not disqualify it from any rum lover’s shelf. But the chaos I noted earlier comes after you let it sit for the aforementioned few days. By the fourth day the rum becomes sharp, biting, and almost vinegary, and while one can still get the smorgasbord of fruitiness which is the source of its exceptionalism, it is no longer feels like the same rum one started with. Pouring a fresh sample right next to it on that day showed me the metamorphosis, and I believe that oxidation is something to beware of for any opened but long-untouched bottle. As it turned out, an amazingly generous aficionado by the name of Nico Rumlover (long may his glass remain full) sent me not one or two additional Savanna samples, but eight more, just so that I could give them a shot…so look for those write-ups in the months to come. Along with several other rums and rhums, I used all of them (and the Intense) as comparators for this review. Historical distillery notes can be found in the Makers section for those whose interests run that way. Rum Nation looks to be releasing a Savanna 12 YO at 59.5% sometime this year. Our global rum travels have moved us around from Japan, Panama, Barbados, Guadeloupe, Brazil, Nicaragua, Jamaica, Antigua, Laos and Mauritius (and that’s just within the last eight weeks); so let’s do one more, and turn our attention to Île de la Réunion, where, as you might recall, three companies produce rums – Rivière du Mât, Isautier, and Savanna, with Isautier being the oldest (it was established in 1845 and is now in its sixth generation of the family). If one wants to be picky Savanna has existed for far longer, but the company in its modern form dates back only to 1948 and lest I bore you to tears with another historical treatise, I refer you to the small company bio written as an accompaniment to this review. 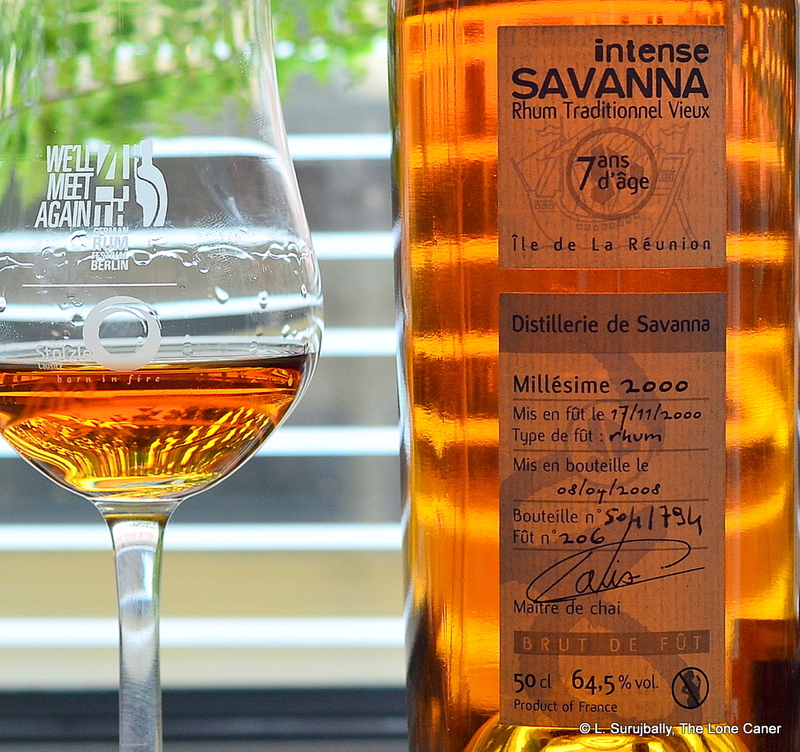 Savanna is unusual in that it makes both agricoles and traditional rums, so it’s always a good idea to check the label closely – in this case “Traditionnel” refers to a molasses-based product. And take a moment to admire the information they provide, which is quite comprehensive (bar additives, which I somehow doubt they have). The rum I tried here was quite a beast – it was a seven-year-old year 2000 millésime distilled in November 2000 and bottled April 2008 with an outturn of just under 800 bottles, and issued at a whopping 64.5% – and that’s not unusual for them, as there are quite a few of such cask strength bruisers in their lineup. I’m as courageous as the next man, but honesty compels me to admit that any time I see a rum redlining north of 60% my spirit quails just a bit…even as I’m consumed by the equal and opposite desire (perhaps a masochistic one) to match myself against it. And here I’m glad I did, for this is quite a nifty product by any yardstick. On the nose it was amazing for that strength – initially it presented something of the light clarity we associate with agricoles (which this was not), before turning deep and creamy, with opening salvos of vanilla, caramel and brine, vaguely akin to a very strong latte….or teeth-staining bush tea. It was weirdly herbal, yet not too much – that surprising vegetal element had been well controlled, fortunately…I’m not sure what my reaction would have been had I detected an obvious and overwhelming agricole profile in a supposedly molasses originating rum. And yes, it was intense, remarkably so, without the raw scraping of coarse sandpaper that might have ruined something less carefully made. I don’t always add water while nosing a spirit, but here I did and the rum relaxed, and gave additional scents of delicate flowers and a hint of breakfast spices. The palate lost some of the depth and creaminess, becoming instead sharply crisp and clean, quite floral, and almost delicately sweet. Even so, one had to be careful to ride the shockwave of proof with some care, given the ABV. Frangipani blossoms, bags of tart fruits (red guavas, half-ripe Indian mangos and citrus rind) and vanillas were the core of the taste, around which swirled a mad whirpool of additional, and very well balanced flavors of green grapes, unripe pineapples, more mangos, and peaches, plus some coffee grounds. It was powerful yes, and amazingly tasty when taken in measured sips. It all came down to the end, where the finish started out sharp and dry and intense, and then eased off the throttle. Some of the smooth creaminess returned here (was that coconut shavings and yoghurt I was sensing? ), to which was added a swirl of brine and olives, grapes, vanilla. The way the flavours all came together to support each other was really quite something – no one single element dominated at the expense of any other, and all pulled in the same direction to provide a lovely taste experience that would do any rum proud. So far I’ve not tried much from Réunion aside from various examples of the very pleasant ones from Rivière du Mât (their 2004 Millésime was absolutely wonderful). If a second distillery from the island can produce something so interesting and tasty in a rum picked at random, I think I’ll redirect some of my purchasing decisions over there. This is a rum that reminds me a lot of full proof hooch from Guadeloupe, doing much of the same high wire act between the clear cleanliness of an agricole and the deep and growly strength and flavour of the molasses boyos. It’s a carefully controlled and exactingly made product, moulded into a rum that is an utter treat to inhale, to sip and to savour, and I’ll tell you, with all that is going on under the hood of this thing, they sure weren’t kidding when they called it “Intense.” It’s not a complete success, no, but even so I’m annoyed with myself, now, for just having bought one. Note: This intriguing 7 year old interested me enough to spring for another >60% beefcake from the company, the High Ester Rum from Reunion (HERR). The entire line of high-ester Grand Arôme rums made by Savanna is supposedly a bunch of experimental flavour bombs, so can you imagine what a cask strength version of that is like? The XO is more expensive, and slightly older, yet I feel this one is better in every way that counts: I’m going to take a deep breath, go out on a limb…and say I think this is among the best rums Rivière du Mât have yet created. 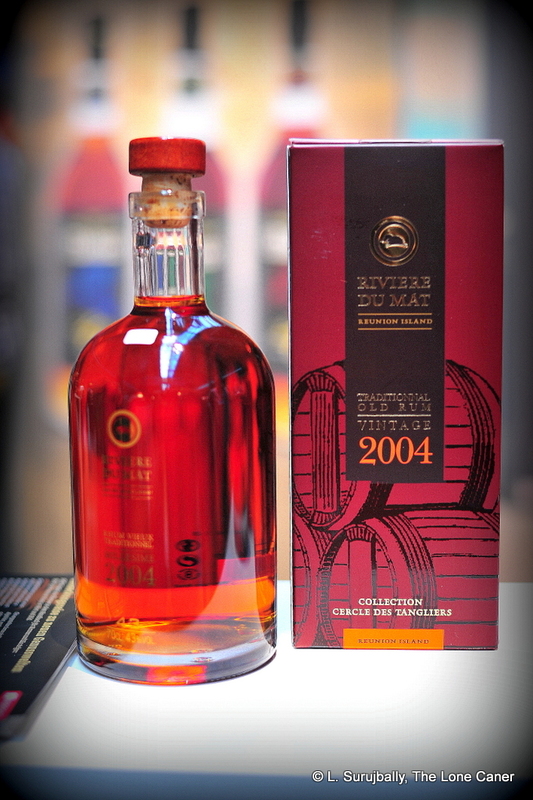 Full of beans and enthusiasm after the frothing delight that was the Rivière du Mât XO, I decided to dump the previous subject of my 200th review, and go immediately to the Millésime 2004, which is close to the top of their range, and one of the better rums I had in 2014. For a rum that is less than ten years old, that says a lot for its quality and the ability of the dude who put it together. It’s a queer thing that there is not really much to distinguish this rum were you to see it on a shelf next to its siblings, the Grand Reserve, or the XO. Indeed, with its maroon-brown box and similar bottle shape, it almost fades into obscurity next to the fire-engine red of the XO and the black of the Reserve (which may be good for the patient hunter of high-end rums, not so good for those who just pick a rum ‘cause, y’know, it looks real cool). The XO had an average age of just over eight years, and this was eight years flat. Both rums were aged in limousin oak, but with two crucial differences: all of the Millésime stock came from 2004 distillate selected as exceptional by the master blender, and 30% of it was aged in casks that previously held port before being married at the back end. Perhaps this was where the extra fillip of quality derived, because I’ll tell you, it started right from the nose, which was remarkably smooth and quite soft, easygoing without displaying that delicacy which so often makes a mockery of any attempts to dissect the profile. I remarked on precisely such a fragile profile in the Reserve yet in both these rums (both of which derive from molasses, not cane juice so they’re not agricoles), there was a clean and clear set of tastes: they stated with a melange of crackers and cream cheese, whipped cream, strawberries, cherries and slightly overripe apricots; this then developed on opening into notes of vanilla, ginger and nutmeg with a little coffee, rich and sensuous to smell. It suggested good future experiences to the drinker, like a girl in the red dress at the bar who’s tipping you a wink and a smile (well, we can all hope, can’t we?). 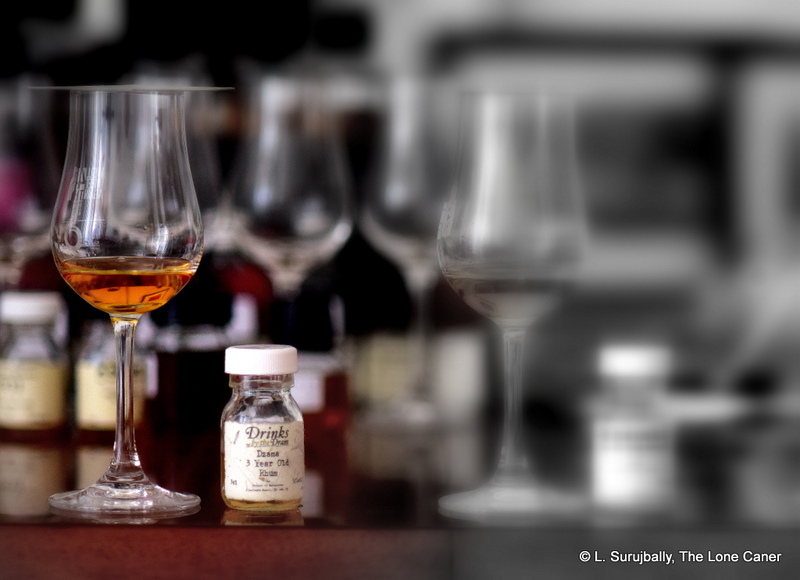 I find in quite a few rums, that while the nose promises, the taste doesn’t always deliver. Not here. It was, quite frankly, remarkably sumptuous. The Millesime 2004 was medium bodied and toffee brown, and had an immediate taste of honey and dried flowers to get things rolling, and then more fruits came crowding onto the palate, tobacco and a little aromatic smoke, coffee, ginger, breakfast spices, some of the buttery smoothness of over-soaked french bread. I loved it. It was smooth and warm and yet distinct and luxurious, like a Louis Vuitton handbag my wife keeps bugging me to buy. And it faded well, again with warmth and friendliness, no spite, leaving behind the faint backend notes of caramel and coffee and toffee, and a hint of dried flower petals. This is a rum I have no problems recommending. It demonstrates why a lower-costing, lesser-aged rum always wins over a five hundred dollar thirty-year-old. That pricey, geriatric gentleman on your sideboard can never truly go beyond what you thought it would be (though of course it can fall short)…so it’ll not exceed your sense of, well, entitlement. It’s supposed to be phenomenal – that’s why you grandly forked over the cash your wife was hoarding for that handbag: you’ve coughed up for quality, so that thing had better put out. With a rum like the 2004 Millésime — which, for around €60 can be considered relatively affordable in comparison — you won’t go in expecting a whole lot, it being an 8-year-old and all…and when it over-delivers like it does, it feels like God loves you. And that you’ve made a discovery you can’t help but share. Background to the company is given in the Grande Reserve review. Soft, firm, tasty and an all ‘round excellent rum. It could have been stronger, but that doesn’t invalidate the quality of what you do get. Sometimes a positive review leaves me glumpish. This is a great rum, older cousin to the also interesting Grande Réserve, well put together, subtle, classy, soft, and possessing a real good taste…yet I guarantee that my inbox will be filled with grumbling queries as to why I bother writing about rums many can’t get. In fact, the majority of people reading this will ask variations of “So?”, “From where wuz dat again?” and the final resigned snort of annoyance, “Well, if me kian gettit, me nah want it.” And believe me, I feel for you guys. 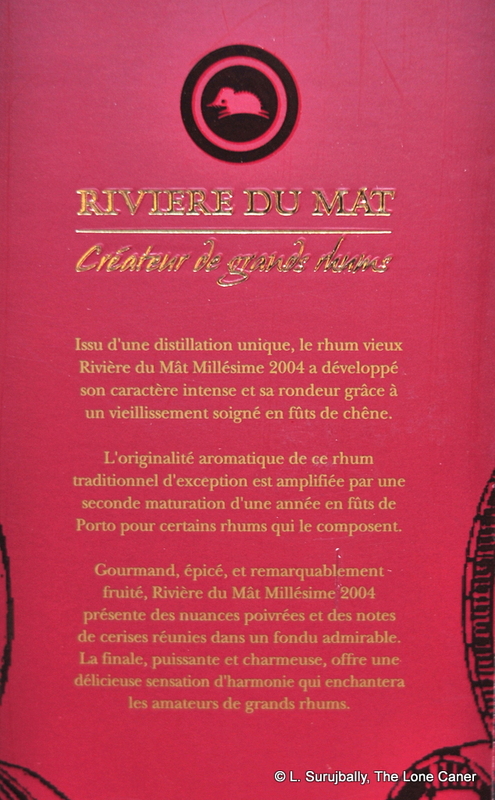 Rum like the Rivière du Mât XO, made on the Réunion island in the Indian Ocean east of Madagascar, gets shipped and sold primarily in Europe, and a few places further afield. Therein lies part of the problem, I think. Not many in North America (or Asia for that matter, because that place has a massive tippling class) will have ever heard of this rum, or seen it, or had a chance to taste it. It’s not on their shelves, and doesn’t get reviewed often enough, and therefore you can just see some poor rum-loving guy in Kansas, in Manitoba, or Bumpole City in Noplace county, shrugging his shoulders and turning to the Lamb’s or Sailor Jerry. Because what choice does he have? There aren’t enough people trumpeting the “other stuff” and (worse yet) nobody imports it. And that’s a real shame, because when I uncorked the XO, well, lemme tell you straight out, for a rum bottled at a relatively fluffy 42%, the nose on this thing was good. Raisins and dates, nicely dried, real solid richness wafted gently into my schnozz, morphing into new chopped fresh and fleshy fruits: peaches in cream. Vanilla and caramel and white flowers entered stage right and took their bow in the spotlight, and through it all was a really odd steely hint of tonic water…you know, the type you add to your gin. Sultanas and lemon peel finished things off. To say I was pleased would be understating the matter: I loved the thing. In fact, I nearly brained my wife with my glass as I swung around in overeager enthusiasm to get her to take a sniff. Oh and did I mention the taste? The palate is damned fine as well. Here the ageing became more apparent because mingling in the marketplace of more dried fruit, dates, figs, and mango — or guava — jam, was cigars, leather, some smoke, well integrated with the whole. The rum was medium bodied rather than heavy, yet displayed a lovely fullness to the tongue, akin to drinkable honey, that encouraged, nay, demanded, a second, third and fourth taste, and one that even a heavier molasses-drenched beefcake wouldn’t be ashamed to display. On a 42% rum of such soft pulchritude, I didn’t expect a long and lasting goodbye kiss, and therefore didn’t fault the easy finish too much – it was warm, breathy, didn’t outstay its welcome, and waved some unaggressive flavours of caramel, tobacco and raisins and caramel at me before fading away. It’s a curious fact that while the company’s younger products are clearly noted by them as being agricultural rums, no such information is given for the older ones. And as I write this, an email from RdM comes in telling me that no, the older rhums are not agricoles, so consider the matter settled. 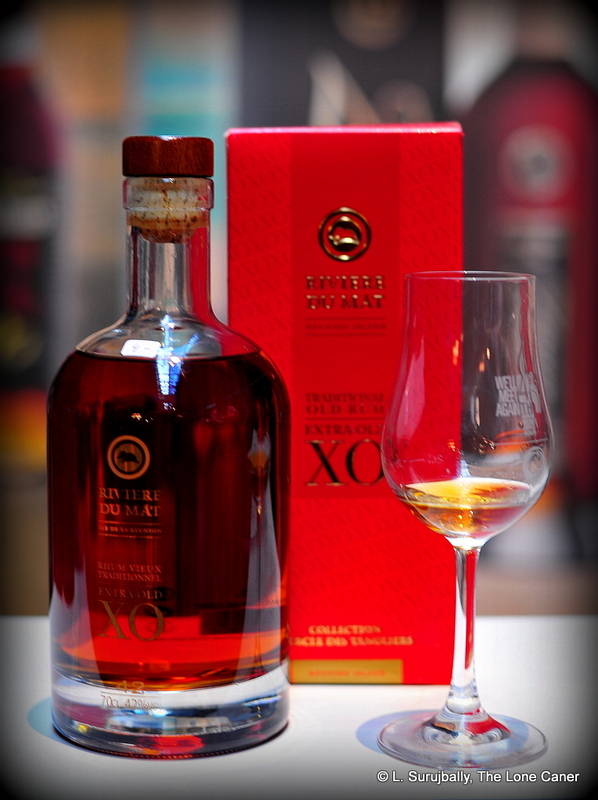 The XO is a blend of five rums aged in Limousin oak – cognac – barrels (a lot of them are new), for between six to nine years, the average age being just over eight, and in this they may have done a segue from Plantation who have a similar ageing philosophy, albeit the more traditional ‘finishing’ approach of oak first and longest, and a quick sheep dip into the cognac. Anyway, without undue effort, I’d have to say that I liked the XO more than the Grande Reserve however indifferent I might have been to the package, which seemed to be somewhat a step down…maybe it’s that glaring fire-engine red box, dunno – the bottle is fine. Still, I should really stop whinging, because for around fifty euros, this rum gives value for money, even if it can’t be found in many of the watering holes where dedicated rummies go to type annoyed emails to me. So maybe the best I can do is take another sniff and taste (maybe another two, or five) of this excellent rum from Reunion, drown my grumpiness, answer emails…and look forward to the Millesime 2004. I’ve covered the history and background of Rivière du Mât in the Grande Reserve review, so won’t repeat it here. The little hedgehog like device within the circular seal is referred to as a “tanglier”: the company notes that it is a legendary beast, inspired from the Tangue (hedgehog) and the Sanglier (boar). The tanglier symbolizes the alliance between strength and tradition; so a marketing thing, then, like Bundie’s polar bear. A tasty, svelte, supple rum like this brings home the point of how widespread the world of rum is, how we are too often satisfied with too little, and why should demand more. Even at 40%, this rum is quite a drinking experience. Réunion? Quick, place that on a map. Casting around for something to look at to close out 2014, I settled on this sprightly and supple forty percenter. This was not just because I wanted to cast a geographically wider net (though this is also true) – but because when you see a good rum, you really want to toot its horn a bit. While I’m no longer as stuck with loving only 40% rums as I used to be, there’s no reason for me to deny this rum its rightful plaudits. It’s good. Appearance wise, I had no objections. Stiff cardboard box, round shouldered bottle, plastic tipped cork, all holding within them a golden-brown spirit with tints of red. It certainly smelled great, when I poured it out. For a rum as relatively lacking in oomph (compared to some of the Tiger Bay toughs I’ve been getting mugged by over the last months), the 40% ABV was really kind of fun. It was…well, zippy. Happy. It was zesty, light, clear and vegetal. I don’t know why, but I kept thinking of daisies, spring picnics on a green sunlit meadow somewhere. The rum felt like it was frolicking over the nose. Nothing heavy here, only scents of orange peel, sweet fresh sap, vanilla, light white flower petals dried between the leaves of an old book; guava and sugar cane and fresh mown grass after a light rain. That same cheerful sprightliness was also evident on the palate. There were a few references that stated the core distillate was made from molasses, yet it is remarkable how the overall taste was light, and what clarity it displayed: it seemed to be more of an agricole than anything else. Those same easy-going floral notes carried over, and here the ageing was more evident – baked candied apples, ginger, baking spices, vanilla and sweet wooden notes, very well done. Adding anything to this is pointless because it has a delicacy to it that would be rent apart by anything but the mildest of mixing agents – even water dilutes it too much. As for the fade, it was medium long, pleasantly aromatic, and tickled your tonsils rather than trying to skewer them. All in all, a lovely très vieux with a little bit of bite to let you know it was there, and not to be taken as an underproof. You could almost imagine it wearing shades and a Hawaiian shirt on a beach somewhere, watching the tide come in. 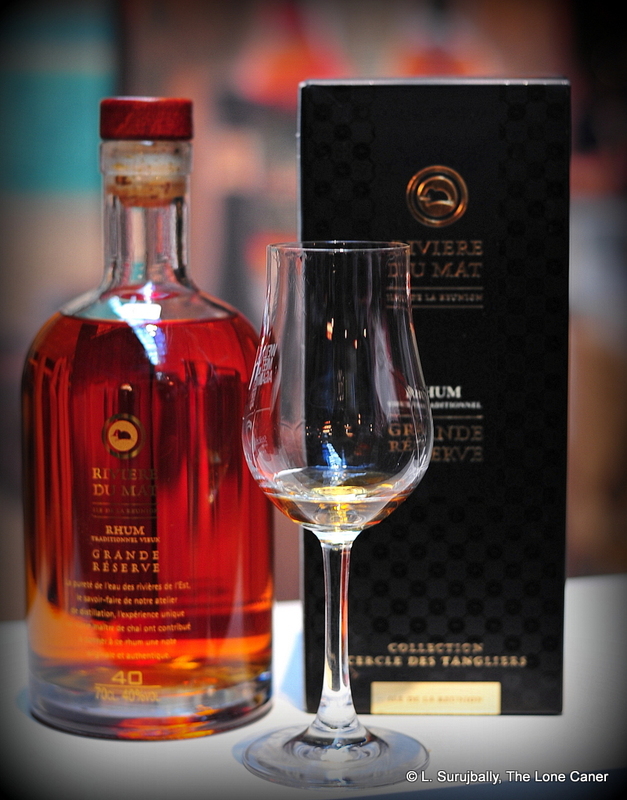 The Grande Réserve is a blend of rums aged six years or more in Limousin barrels, and well put together – one hardly tasted smoke and tannins and leather of any kind. It hails from the island of Réunion, which is located in the Indian Ocean, east of Madagascar. Although originally settled by the Portuguese, by the 16th Century, it was taken over by the French, and these days is a French Department. Because of that, it is considered part of France, as if it was right on the mainland, and therefore also part of the Eurozone. Réunion has quite a pedigree with respect to rum. Sugar has always and traditionally been the chief agricultural export crop, and the first stills were brought by the French to the Island as far back as 1704; in 1815 the first modern distillery set up by Charles Panon-Desbassyns and coincided with the start of large-scale sugar-production, which took up just about all the sugar-cane harvested. The production of local ‘arack’ (or ‘sugar brandy’, produced from sugar-cane juice) was limited to production from the residue of sugar manufacture. The number of distilleries fluctuated from six in 1842 to thirty one in 1928, down to one during the second world war, and three presently: Savanna, Rivière du Mât and Isautier. All three produce the most famous brand of the island: Rhum Charrette. The other well-known brands of these distilleries are Savanna rums, which is a brand that consists of more than 12 different rums (and there I was, grumbling about the seven rums in Ocean’s Atlantic edition, remember? ), the Rivière du Mât, Isautier, Chatel, Varangues and Belle-Vue rums. All in all, then, this is a rum that is light, easygoing and an absolute pleasure to drink neat. As an entry level vieux, it may be a tough ‘un to beat. I can’t wait to write about the XO by the same company: that one is also good, but also more pricey. If you’re looking for something off the beaten track, with a taste all its own, not too expensive, with aromatic, clear and slightly fruity notes, then this is as good a rum to buy as any others…others which may be more available and perhaps better known in the bars of the west than Rivière-du-Mât’s rum — but not necessarily better. In spite of the prevailing belief that rums are Caribbean almost by definition, it’s axiomatic that many other nations and regions produce them. Over the years I’ve found that the most readily identifiable and distinctive (I don’t say “best”) products, products that have a flavour profile all their own, usually hail from some distant part of the world where climatic and soil conditions are far removed from the norm: consider, for example the Bundaberg, the Old Port, or even the Tanduay. Now sure, flavourings are sometimes added to the mix with the heedlessness of Emeril chucking spices…but not always. Sometimes it’s just the terroire. Such a one is the Rhum Vieux Millésimé 1998 ten year old, made and bottled in Madagascar from locally grown cane and molasses, offered at 45% in a bottle that is rather amusingly wrapped in a banana leaf (or a reasonable facsimile thereof). This is a rhum that won a gold medal at the International Wine and Spirits Competition in 2012, and is one lovely piece of work. Take for starters, the initial nose: brown sugar, coffee and mocha, straight off, very smooth and inviting – 45% was a good strength for this rum. I looked at the labelling again with some surprise – was this a spiced rum and they forgot to mention it? Nope. What you got was it. It was followed by vanilla, cloves, nutmeg and a soft background of bananas, all quite unaggressive and easygoing. There was even some vague vegetal note there after a bit, almost imperceptible. The palate broke little new ground, simply built on that excellent lead-in: more vanilla (not enough to make me suspicious about flavouring, yet I couldn’t dismiss the thought entirely), coffee, burnt sugar, nougat. Fried sweet bananas (I loved those as a kid), nuts, peaches. This rum was lovely, just lovely – soft and warm and exactly strong enough for what it was – a higher proof might have made it too spicy. There was even, after a few minutes and a drop of water, leather and the sweet perfume of aromatic cigarillos. Some ground walnuts rounded out the profile. The finish was surprisingly short, yet still that warmth persisted, and closing notes of white pepper, smoke and those walnuts again. These tasting notes sound utterly conventional, don’t they? Yet they’re not, not really – the balance of the vegetal notes and vanilla and nuts and sweetness of bananas popping in oil is not at all like the Caribbean rums with which many of us are familiar; I imagine some of this taste profile comes from the Pernod Ricard barrels shipped to Madagascar to age this rum the requisite ten years; but perhaps equal credit comes from the cane itself and the environment in which it is made. 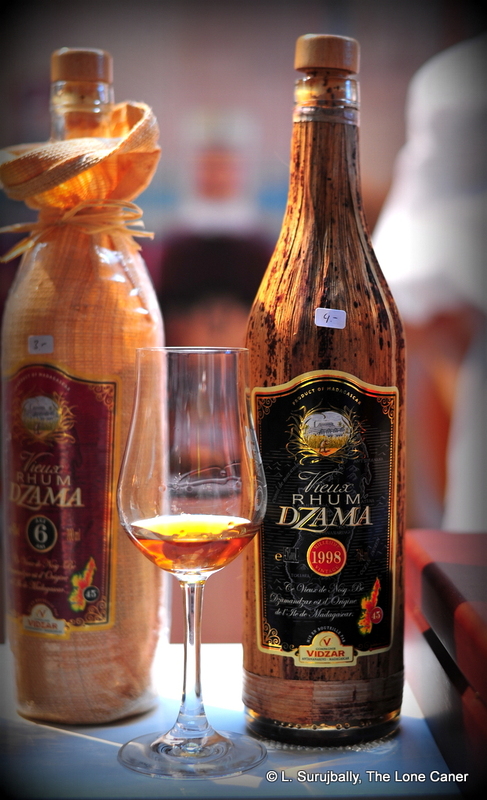 Dzama rum is made by Vidzar, one of those local companies like Banks DIH in Guyana, or Clarke’s Court in Grenada, which have a rather larger visibility in their home country than they do abroad (this may change as they expand their markets). 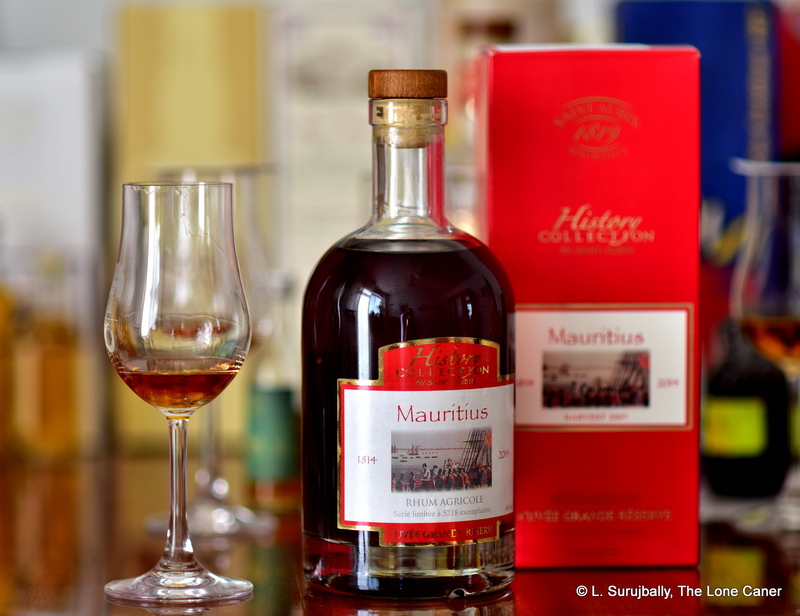 The company was formed in 1982 due to the efforts of Mr. Lucien Fohine, who noted that the small sugar factory on the tiny island of Nosy Be produced a distillate that had distinctive flavours which persisted into the final distilled products…mostly low level rum for local consumption, to that point. After some investigation, he concluded it came from the ylang-ylang plant (also known as the macassar oil plant, or the perfume tree) whose roots intermingled with that of the cane. (If this rum is an example of the flavour holdover, he may be on to something, though I’m ambivalent about the science behind that). In an attempt to distill a decent rum to elevate the craft of his island, he formed a company Vidzar (a contraction of Vieux Rhum de Dzamandzar), located close to the sugar cane fields of Nosy Be, by a village called Dzamadzar. The company makes a range of rums for sale, including the Dzama Club, 3 YO and 6 YO, the Dzama XV 15 year old and Cuvée Noire (untried by me) and is starting to sell in the European market. This particular ten year old was aged in the aforementioned Pernod Ricard barrels and was distilled in 1998 but the date itself is just a marker, not a commemoration of anything special (the current ten year old on the company site is the 2000 Millésimé) – I’ll hazard a guess that it was a series of barrels set aside by the master blender as simply being of higher quality. I’ve remarked before that one rum does not sink a brand, or define it – yet I have to be honest and say that a bad one tends to make me leery about approaching others in the range, while conversely, a good one makes me enthusiastic to do so – that’s human nature. With this excellent rum hailing from a region I’ve not tried before, whose profile is remarkably distinctive and far from unpleasant, I’m pretty stoked to see what else Dzama has in the larder the next time I get a chance to buy one. You could do worse than trying some yourself…and this one would be an excellent place to start.